This winter was the longest AZ has ever had. And thus, began my quest for the perfect pair of black joggers. Yes, I’m calling it a quest considering the fact that I ordered FIVE different pairs before finding the right ones! But, I finally found them and they were so worth the wait. Black joggers are so versatile, it’s essential to have a great pair you love! There are so many ways to wear black joggers that I consider them a wardrobe staple no matter where you live. Need some ideas? 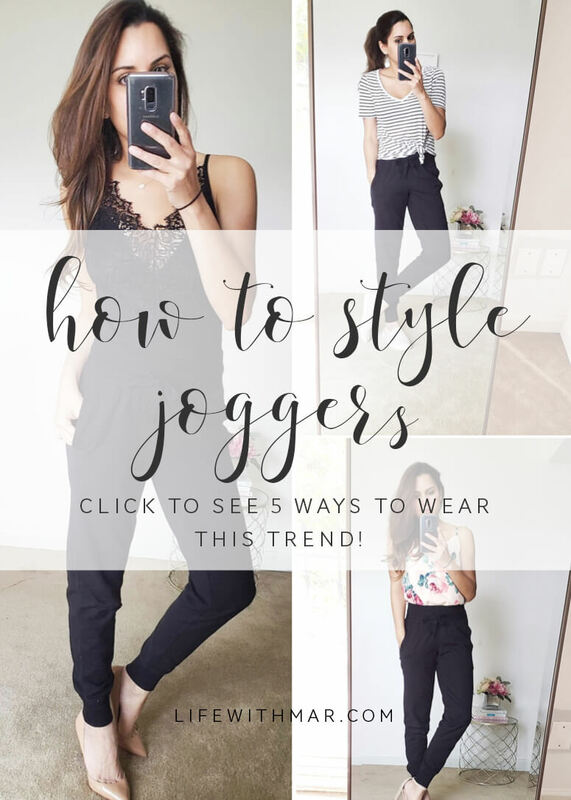 Here’s how to style joggers, five different ways! Probably the most common way I style joggers is for weekending with cute sneaks, a hat and a tee! I fell in love with these black joggers because they’re perfectly tapered (i.e. they don’t look sloppy) AND they’re high waisted! So you can easily top in a tee like my Paige top. I just gotthese Adidas sneaksand they’re probably the most comfortable sneaker I’ve ever owned! This rose version sells out a lot, but I found at pair at Nordstrom Rack and they’re on sale under $50 with just a few sizes left! Black is so versatile! That’s why we all love that little black dress as a wardrobe staple. Likewise, even though these jogger pants are comfy AF, you can still dress them up. If you’re not feeling the tucked-in tee, try tying a knot. It’s a simple style trick that makes the “pants and a tee” look not as basic. To get the look, I like these BP tees since they’re a bit on the longer side it’s easier to create a knot. Plus, they’re cheap at $15, so you can’t go wrong! Another reason I love these high-waist joggers? You can pair them with a crop top! When they’re high-waisted like these, they only show a bit of skin and it’s a cute and casual look. 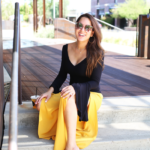 I work from home so I’m all about outfits that can go from work-at-home-comfy to office chic. 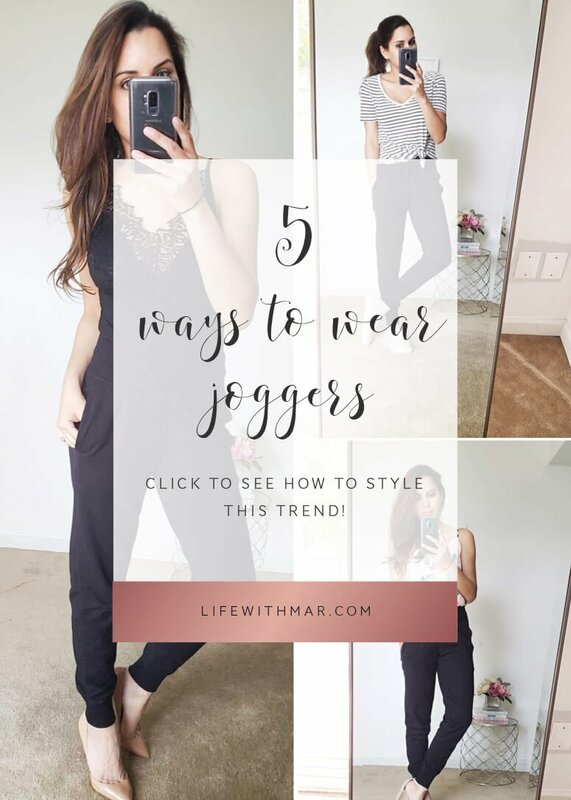 With black joggers, you totally can! Style your joggers with a black bodysuitand top with a blazer. For this look, I went with an orange blazer to add a bold color, but any color works for this black-on-black look. And yes, you can totally style your joggers with heels! Before settling on these black joggers, I tried some from Target, Amazon and another pair from Nordstrom Rack that didn’t work. Unfortunately, my last pair of black joggers ripped so I had to find a new pair. These are more comfy at-home lounge-style, but if you can I recommend you also get a pair that’s closer to a trouser material. They’re incredibly versatile and great if you work in an office! For now, since I’m at home, I needed some that would keep me cozy on a rainy day, comfy running errands and that I could easily dress up. 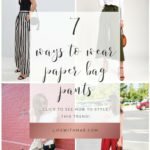 I hope this post has helped you figure out how to style joggers, there are so many ways to wear them! How do you like to style your joggers? Linking up with: Rosy Outlook Blog & Seeking Sunshine. I almost always wear mine casually but am loving the way you dressed them up too! I think I may need to invest in a couple more pairs..
They’re a basic…I feel like you can’t go wrong with a few! Love all these ideas! All of them are super cute but the first and last one are my favs! Hah, there’s no such thing! I love how you styled all these looks. I’m going to need to get a pair. They are so cute. I wasn’t sure about them at first either, but now I find them so comfy and practical! Thanks for the comment. I love all these looks! I have been wearing joggers over leggings lately because they’re so comfortable! These looks are giving me a lot of inspiration! You’ve styled black joggers so well! Love all the different ways. I gotta break mine out more! Joggers are SO STINKIN’ CUTE! I love how easy they are to style. OMG YES I am literally in love this post. Thank you for the great ideas. There’s nothing like wearing joggers to work or on date night! I’m not sure I’ll ever pull off joggers like this, but you sure make them look cute! So many cute ideas! My favorite is with your striped tee. It’s so casual yet so chic! Thanks! That’s probably the look I go to the most! Love how you styled these joggers! 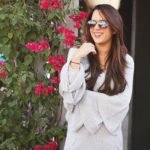 My favorite look is the one with the blazer!